Best concealer for under-eye shadows. I've had shadows under my eyes for as long as I can remember. In fact, my mother has said that I've had them since childhood and she used to worry about me. No need, but I've always been very aware of them. 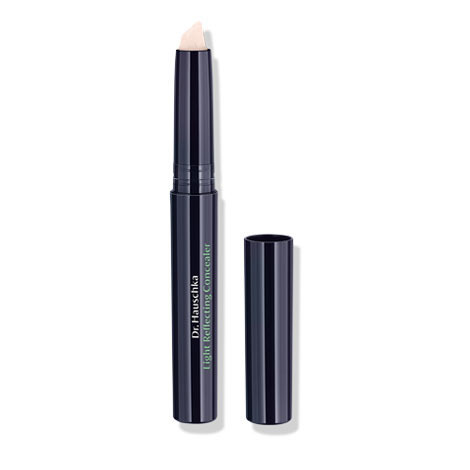 I've tried many concealers over the years but this is by far the best. All the other were really too heavy for the under-eye skin and too stiff, not smoothing on easily. This one, however, is perfect. So easy to apply, so light and, for my fair skin, the perfect shade (00). Of course, being light-reflecting it depends to some extent on the angle of the light, so that I can't say that I've never seen an under-eye shadow since; if only! But when I began using it I was quite pleased with the apparent decrease in the shadows and was very glad to have my opinion confirmed by my husband who asked me at breakfast one morning whether I was wearing "that shadow stuff for your eyes"; when I said that I was he replied, "Well, it works." Can't get much better recommendation than that, as normally he glazes over the moment I begin to mention any appearance-related topic (hair, makeup, etc.). So, top marks to Dr. Hauschka. Thank you. Does give some cover, blends well, does reflect light. Not as good as the original product in gold packaging you may know by a main brand, but this is better for the environment so that's why I bought it.